RARE BOOK, only a very limited number of copies are still available. 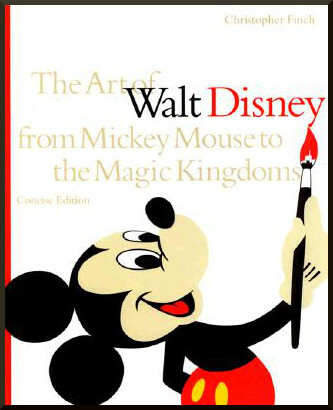 The Art of Walt Disney is an enduring classic – a book that has sold nearly 600,000 copies in two lavish hardcover editions. Drawing on unfettered access to Disney artists and archives, Christopher Finch chronicles every facet of Disney art, including animation, live-action, and theme parks – from Mickey's 1928 debut to the Fantasia 2000. All the major milestones receive full coverage in this updated softcover edition, including several projects – Toy Story, the Broadway Lion King, Mulan, and Disney's Animal Kingdom, among others – that don't appear in the 1995 hardcover edition. Wonderfully inexpensive, this will be the perfect gift for Disney fans everywhere. Christopher Finch was born and raised on the island of Guernsey in the British Channel Islands, and now lives in Los Angeles. He is an artist and a photographer who has had one person shows in New York and California, and he is the author of almost thirty non-fiction books. Roy E. Disney (1930 – 2009) was the nephew of Walt Disney and vice chairman of the board of the Walt Disney Company.